Dermaplaning is a precise and highly effective superficial exfoliation. It relies on the simplest of tools but the most artful of skill to deeply scrape and exfoliate away the top layers of inert skin. This low-tech treatment yields the highest dividends in skin toning, clarifying and re-texturizing and is ideally suited for all ages and skin types. Dermaplaning also removes hair from the treated areas leaving behind a smooth, beautiful face free from embarrassing and unwanted hair. Dermaplaning does not remove the root of facial hair, but instead removes the hair that sits above the epidermis. Dermaplaning is designed to work effectively with the vellus hairs found on your face and hair does not appear thicker or darker as it grows back in. Dermaplaning can remove up to 2 to 3 week’s worth of rough, dead skin and build up can be performed every 3 to 4 weeks, for best results. Dermaplaning uses a specifically-developed blade that can safely remove layers of dead skin. Depending upon the severity and depth at which dead and unwanted skin sits on the face the length of your treatment may range from several minutes to an hour. Deeper lines and more severe buildup of dead skin require more layers of skin to be removed. Dermaplaning can be performed on small, precise areas of the skin or can be applied to larger regions, including the entire face. 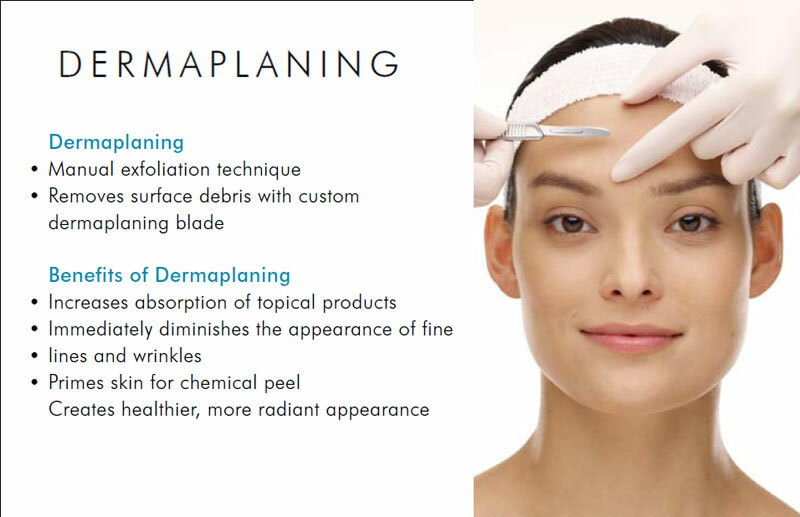 Dermaplaning can also be performed in addition to other skin treatments, such as chemical peels or microdermabrasion. This treatment also encourages the growth of new, healthy skin cells and can have a positive impact on the skin cell life cycle. Dermaplaning is a highly effective way to resurface the skin and is a highly effective method for leveling out uneven surfaces on the face. Dermaplaning is gentle and does not break the capillaries on the face, which more aggressive exfoliators may do. This prevents skin discoloration or scarring. 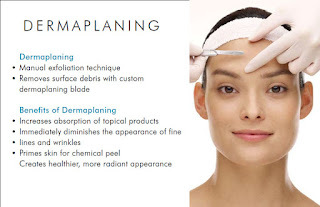 Since Dermaplaning does not involve the application of chemicals it is a great alternative for individuals who have sensitive skin and cannot undergo chemical peels or other chemically based treatments. Dermaplaning is a non-surgical procedure and requires no recovery time nor does it produce any visible side effects. · Immediately refines the youthfulness of the skin. · Removes facial hair (peach fuzz), which absorbs oil, dirt, environmental toxins, and excess products. · Removes surface dead/keratinized skin cells. · Improves elasticity and texture. · Stimulates circulation of blood and lymph flow. · Enhances the natural shedding process of the skin. · Softens the appearance of fine lines and wrinkles. · Minimizes the appearance of pores. · Reduces hyper-pigmentation creating a more even skin tone. · Increases the skin's ability to absorb products. If you have any of the following conditions or use any listed medications, I cannot perform the service and an alternative treatment will be recommended. · Sun, wind, or chemically burned or otherwise raw skin. · If you are taking antibiotics, you should wait until 10 days after completion.